The suffering caused and reaped by those who inflict violence is obvious in the suicides of men returning from war. It spills over into alcoholism, drug addiction, domestic violence, and perpetual violence to innocent wild beings. It seems obvious that none will kill their way to a sense of fulfillment or happiness. As the power and resources of the state Department of Natural Resources are focused on expanding killing, half of the wildlife on earth has already been destroyed. This is not a linear destruction. More than half of our world’s wild beings from bees to bears to tigers to 90 percent of the oceans’ large mammals have been killed off in just 40 years. In the midst of this insanity, a new role model of man is emerging. And women are embracing this new man, who is secure enough to be compassionate and loving and life-affirming. I see it with Rick Hanestad of Dunn County, NASCAR driver, taught to be a trapper from the age of 5 — but transformed by adopting a coyote pup who became part of his family by chance. “I cannot tell you how this pup has turned me upside down on coyotes. He is the sweetest animal,” Rick told me. Yet coyotes are killed mercilessly without limit. I see it in Jeff Traska, whom I met when the head of special investigations for the DNR, Tom Solin, asked me to serve the state on the Captive Bear and Cougar Committee in 2000. Traska had been a bear hunter. He told me, “I realized that I was curious about bears and I did not learn much about them when they were dead in the back of my truck.” He started the Wisconsin Black Bear Education Center near Wausau. He describes himself as a “reformed sport hunter” who loves the three bears he took into his sanctuary, providing six acres and a pond. Yet another 4,750 bears will be killed in Wisconsin this fall. Yet hundreds of thousands of deer will be killed in Wisconsin this year, and the public is silent. 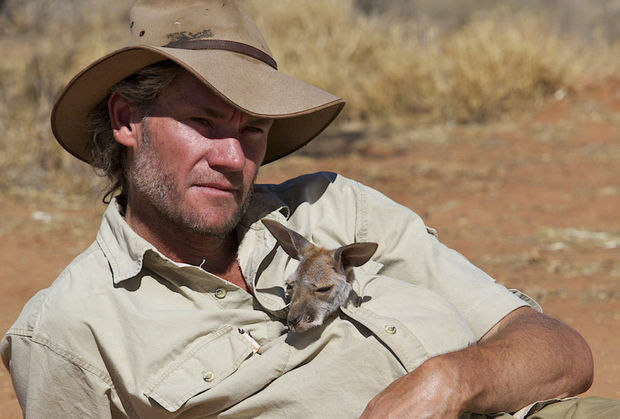 He studies the mother kangaroos to learn how to bond with the babies: “I take notes.” He shares saliva with them to bond and keeps them close to his body at night to keep them warm, just like mum. The birth of a baby kangaroo as a jelly-bean-sized embryo that follows the scent of its mother’s milk to her pouch is a miracle of nature. Brolga’s relationship with one of the new mothers, Ella, enables him to look into her pouch and monitor the tiny baby’s progress and give it to us on film. Great Lakes and Wyoming wolves are in danger of losing protections of the Endangered Species Act. Please contact your federal legislators and sign a petition to help. Please contact your U.S. senators and ask them to oppose the Bipartisan Sportsmen’s Act of 2015, which seeks to open federal lands to killing, creating shooting ranges and more. Thanks…nice to intersperse all the killing with a little relief from a man’s kindness. If you send me your email address ( to me at Madravenspeak@gmail.com) I will put you on my mailing list of columns and alerts.